This semester, the HGSA has focused on building students’ professional development skills. Our first cluster of events focused on writing skills and publications. Our inaugural event this year was an MA research paper workshop, followed by two seminars on turning course and dissertation work into publishable articles. The students who have workshopped their writing in these seminars have received great, qualitative feedback and suggestions that will improve their work. 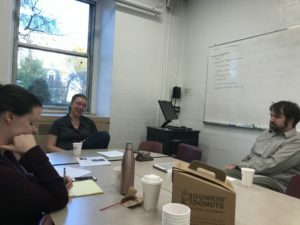 As Ph.D. candidate Nicholas DeAntonis wrote, “Discussing the process of how to publish an article with other graduate students clarified and simplified an otherwise complicated process. Having other graduate students read and provide critical feedback on my paper was a helpful exercise that motivated me to, finally, submit my article to the journal Human Rights Quarterly.” Ph.D. candidate Esther Liberman-Cuenca concurred, stating, “The workshop allowed me to focus in on the parts of the article draft that needed to be better explained, excised, or expanded on. I also got very good comments about re-organizing the paper. It was also helpful for me to answer questions about the project and to justify certain organizational or conceptual decisions I made in the draft.” We are very glad that these participants found the experience helpful, and highly encourage other students who might want feedback on their work to take part in these workshops. In November, we’re switching directions to focus on teaching. We’ll be hosting a workshop on maximizing student participation and using digital humanities in the classroom. These events should wrap up a semester of exciting and valuable professional development exercises. Next semester, we’ll be focusing more on job market issues, both academic and non-academic. As most academic job postings appear between August and October, the spring is the perfect time to start thinking about perfecting CV’s, writing samples, and cover letters. We hope to host workshops in all these areas. We also plan on bringing in some speakers who can tell us about non-academic job opportunities for graduate students. Look for those announcements and our calendar of events towards the end of this semester. Remember that I’m also available for comments and questions, or if you want to pitch an event of your own. Email me at sleccese@fordham.eduanytime!